The Little House of Concrete Bookshelves: Donna Leon "The Golden Egg"
A reread of the final couple of pages, however, revealed Donna Leon had nothing more to say on Commissario Brunetti’s investigation into the death of Davide Cavanella, a deaf and mentally disabled man who worked in Brunetti’s neighbourhood dry cleaner because, basically, there was nothing more to say. Another author might have been tempted to moralise or comment, but with the mystery explained the rather matter of fact Brunetti is off for a walk on the beach. Not that his stroll is likely to be particularly enjoyable. The story starts with the first leaves of autumn beginning to fall, and the investigation doesn’t take that long, but an autumnal, a cold, wet Venice, with the architecture shrouded in grey sheeting mizzle is probably the right setting for Brunetti to brood over the depressing details of what he’d found. A lesser author would take the reader out to the Lido, deliver the protagonist’s melancholy meditations and belabour the moralisations. Readers who’ve been aboard for a while, however, will have a fair idea of the trend Brunetti’s thoughts would have taken and a definite opinion about what he’d have gone on to do afterwards. That, of course, is probably either what he’d done once he’d taken the initial steps that needed to be taken after the latest self-serving directive from Vice Questore Patta (asked Vianello if he’d like to come for a coffee) or, if the time was right, head home for lunch or dinner with his wife and family, drink a little wine and possibly read a little Tacitus. Patta’s request involves Brunetti looking into a seemingly minor violation of the public vending regulations committed by the business partner of the mayor’s future daughter-in-law. It’s an election year, Patta’s out to avoid any hint of a scandal and Brunetti, while he has no desire to help Patta consolidate his political connections, has no choice but to follow the directive, which is, basically, to find out if the vigili involved are trustworthy. The vigili urbani, for those who mightn’t be quite up with the terminology, are the unarmed officers whose job it was to see that city ordinances were obeyed. In this instance they seem to be ignoring the tables set up outside a shop in Campo San Barnaba that sells masks, next to the one with the expensive cheese (Brunetti lives nearby and knows the area fairly well) and it’s possible the proprietors of the mask shop don’t have all the permits to use that space. A petty matter, but where Patta’s concerned, par for the course. Brunetti delivers the task of making a discreet inquiry to a junior officer before heading off with his right hand man for a coffee, learning, along the way that Vianello’s concerned about the ecological implications of his wife’s proposed holiday in the Seychelles. A farm stay hotel in Umbria’s more his style. Brunetti passes through Patta’s antechamber to compare notes with an increasingly subversive Signorina Elettra (Why do we tolerate this ... and not go after them with clubs?) on the way back, and arrives in his office to find the phone ringing. It’s his wife, Paola, informing him of the death of the boy who doesn’t talk at the dry cleaner’s. Although he was actually aged over forty, a deaf mute with the intellectual age of a child, as far as the neighbourhood was concerned he was the boy who helped out at the dry cleaner’s, and nobody knew his name or anything much about him. He seems to have died as the result of an accidental overdose of his mother's sleeping pills, having presumably swallowed a handful because they looked like candy. Paola can’t help being distraught at the thought that he lived a joyless life and died without anyone noticing him, helping him or understanding his situation. But when Brunetti starts making a few inquiries about Davide Cavanella a number of intriguing issues raise their heads, centred around the question of how a man in his forties could have passed through several decades without leaving anything in the way of a paper trail. There’s no birth or baptismal certificate, no passport, no driver’s license, no credit cards and he never seems to have visited a doctor or been enrolled in the school system. In short, there’s nothing that might serve to verify that he actually existed. That’s strange, because given the obvious disability issues, both he and his mother would have been entitled to financial support from government programs designed to help the disabled, and in a country where unethical claims for state assistance are rife, he’s a disabled person for whom no claims were ever lodged. According to Ana Cavanella, who doesn’t want to discuss the death at all, her son’s papers were stolen years ago, and it’s obvious there’s much more to the story than she is letting on. There’s an extra complication since she lives in a working-class neighbourhood where the state is the enemy, and when the police come around asking questions the neighbours become as deaf and mute as the subject of the inquiries. As the clues start to stack up, Brunetti comes to believe the death may not have been an accident and suspects the wealthy Lembo family, aristocratic copper magnates who employed Ana Cavanella for many years and Brunetti gradually draws out the information he needs to form the full picture of Davide Cavanella’s existence. Along the way, of course, he has this other issue with Patta’s request, and there’s also a move afoot to remove Signorina Elettra from her current office and install Patta’s loathsome offsider Lieutenant Scarpa as his official receptionist. That won’t do at all, and Brunetti manages to find a means to prevent it. But the main issue is the Cavanella case, and while Brunetti might have embarked on the inquiry expecting to find nothing suspicious, what he stumbles across instead is chilling, calculating and deeply disturbing. Disturbing enough to have Brunetti, once he’s sorted things out in his own mind (there’s nothing much he can do in any official sense) setting out for a brooding walk along a wind and rain swept Lido. 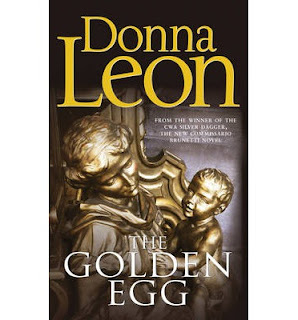 The Golden Egg might seem to be a relatively low-key affair for much of the story, but there’s a sting in the tail and along the way the reader comes across all the elements we’ve come to expect in a Donna Leon story. Brunetti’s family and colleagues go about their business, providing the opportunity for evocative references to Venetian history and architecture, moody ruminations on Italian politics and society, and the regulation descriptions of the city’s food, weather and social life. It’s Number Twenty-two in the series, and shows an author who doesn’t seem to be running out of steam. Remarkably, given the longevity of the series, for my money it’s getting better.